Mohandas is popular as Birbal who earned name and fame as a minister in Akbar's court. Mughal Emperor Akbar was very fond of posing strange questions to his courtiers and provoked them for getting amusing replies. Birbal always used to win the heart of Akbar with his witty and wise replies. There are many stories on his wits and wisdom. One fine morning Emperor Akbar was getting dressed. His grandson came running to him and said naughtily, "Grandpa, grandpa, there is something black in your mustache". He then pulled a hair from Akbar's mustache. "Ah! ah! ouch! Akbar screamed in pain. "Haha! I fooled you grandpa", said the boy. Akbar said lovingly, "Naughty. Go and play. I have to go to the durbar" (Emperor / King's court). While walking to the durbar, Akbar thought, "Aha, today I have a strange question to ask my courtiers. I'm sure even Birbal would find it difficult to answer my question". In the durbar, Akbar said, "Today morning, a person pulled a hair from my mustache and I want to punish him for this act. Can any of you suggest a suitable punishment for the person"? For a moment, there was silence in the court. Suddenly, one courtier after the other started giving their suggestions. "That's a terrible act. He should be punished with life imprisonment" said one courtier. "No he should be hanged Jahanpanah" said the other courtier. "Behead him", shouted another courtier. Akbar looked at Birbal who was silently listening to the suggestions. "Don't you have any suggestions to give?" asked Akbar to Birbal. Birbal replied, "I do have a suggestion Jahanpanah but I would like to speak to your in private". "No Birbal. I want you to speak in the court. Let everyone know what you suggest", said Akbar. "Sure, Jahanpanah, the person should be given a big hug and a kiss as punishment", replied Birbal. "Whhaaat!" everyone were perplexed. Some courtiers thought Birbal might have gone mad. "Well, that's a child's play and it could be only your grandson who might have pulled your mustache. 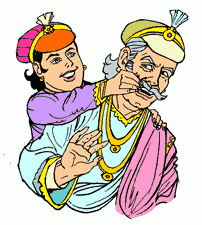 So, he deserves a big hug and kiss from his grandpa", Birbal replied confidently. "Hahaaa! hahaa! the court reverberated with the laughs and applause of the courtiers. As always, Akbar was pleased with Birbal's wise reply and couldn't stop himself from praising Birbal.